Since it's that time of year, I'm reposting this article to help you plan for a healthier year for your kids! If you homeschool like we do now, you can read all those articles here. Walk down the hallways of the Appleton, Wisconsin, Central Alternative High School and you will see students focused on their education, interacting successfully with each other and with their teachers. Notice the calmness and purposefulness that sets these teens apart from others. You will notice that the hallways are different in another respect. They aren't lined with soft drink and junk food machines. Then check out the cafeteria. There is no smell of grease. Burgers, fries and burritos have been replaced with salads, meats prepared with old-fashioned recipes, and whole grain breads. Fresh fruits and vegetables are offered and the students drink water. You just can't trust schools to feed your kids healthy foods. Our kids need nutrient dense meals, but most of what is offered for hot lunches still has trans fats, high fructose corn syrup, MSG and who knows how many other chemicals and preservatives, colors, etc. Besides the fact that most dietitians in charge of school lunches still buy into the “low-fat is better” mentality, so they don't realize they should be using healthy fats for our kids, either (among other things that are important and not known in the mainstream). It's just best to send a lunch with your child every day! Once it's a habit, it's no big deal. Get into the habit of having your kids make their own lunches the night before school. Our Kindergartner even makes her own lunch. Keep only healthy options around so you don't have to worry about what goes in. And don't miss the comments below for more great lunch box ideas. Other leftovers from last night's dinner like a sprouted whole-wheat roll, or spaghetti or soup in a thermos like this one, or leftover chicken strips, Leftover mac & cheese would probably go over well, too! Crispy nuts – Recipe from Nourishing Traditions – it's a way to prepare various nuts to make them much healthier. Yogurt, made with whole-milk only – it's getting easier to find these days now! Just watch the sugar content in the flavored yogurts. You could also add raisins or maple syrup onto plain yogurt. Two of my kids love Deviled eggs. Also, just hard-boiled eggs, are a good snack that you can get by some kids. Maybe sprinkle on some sea salt. Turkey roll-ups (if you can find some good sliced turkey) with cheese inside or veggies if your kids will go for that. We also do this with the ham or bologna we buy from our pasture-based farmer. Don't send juice boxes, and I hope it goes without saying not to send them with pop! I try to give our kids juice only on special occasions, and then it's the kind with 100% juice. If they want pop, I'll let them have an occasional “Izze” – the only ingredients are 100% juice and sparkling water. Otherwise all they drink is water or milk (read about healthy milk choices here), and I also have organic chocolate syrup I let them mix into their milk once in a while for a treat. Update: try making your own homemade soda pop! Organic graham crackers, maybe with organic nut butter in between a couple. Sandwiches w/ leftover meat from last night's dinner, organic nut butter/organic jelly (no trans fats or high fructose corn syrup), tuna fish, a slice of all-natural cheese (no “American” slices, and even better is cheese from grass-fed cows! ), read about lunch meats, hopefully you can find some without MSG, nitrates or preservatives from your local farmer like we can. Try to use whole-grain bread, organic and fermented/sourdough/soaked bread if you can, but at least the kind without high fructose corn syrup or trans fats. Bagels, plain or with cream cheese. Or you could do various bagel sandwiches. 100% whole-wheat – even better if it's made with a soaked flour or sourdough recipe. That's all I can think of right now, because my kids typically take the same thing every day! Do you have more ideas? Share them below! Here's my post on water bottles and plastic safety – some are made with rotten plastic that can leach chemicals into your drink. I found these made by Nalgene and they're made of a safe plastic, HDPE – although as little plastic you can use, the better. (I'd gotten some at Target once for $6 each that I had to take back when I found out they were made with one of the bad plastics: polycarbonate.) These are also wide-mouth, so they get clean in the dishwasher. We use them for soccer practice and school lunches. Always refill these each morning, don't leave water in it for a long period. ***Some even healthier kid's cup alternatives are in the links below. Need more ideas? Click here to check out Katie's Healthy Lunch Box e-Book! Or get my Real Food for Rookies book to help you make good decisions for your kids at the store. 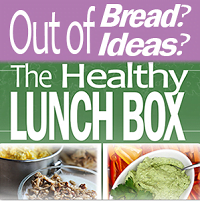 Do you have more healthy lunch box ideas? PLEASE comment below! If your child occasionally asks to eat hot lunch, let them! In my opinion, if you make a huge issue of it, they'll just want it even more. My 3rd grader and Kindergartner have never even asked – probably because they know they get out to recess faster when they don't have to go through the line. Also since they've never had it, it's just not familiar to them. If they did ask for it, though, I'd do what a friend does: let them pick their favorite hot lunch food and only eat it on those days. When the kids are older the crappy options increase, with some schools offering various choices right from fast food restaurants! It's not easy, but when my teen will occasionally say, “I'm going to get lunch at school tomorrow, OK Mom?”, I'll always say OK, because he only asks once every month or two at the MOST, and I just know better than to make it become something bigger than it needs to be…even though he's getting their burgers, with meat from who knows where, fries, a.k.a. “poison sticks”, and a pop…oh boy – I try not to think about it! Also I try to just remember how little of that junk he has compared to some teenagers. 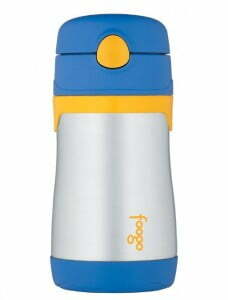 Thermos Straw Bottle/stainless steel – we love ours! Note: I recommend the movie, “Supersize Me“, but BEWARE, there are two different versions: PG-13 and the PG/family friendly version! I’m lucky enough that my kids are used to eating healthy food. No need to force them to eat veggies, they actually love vegetables. Boo to making school lunches again. I have a little over a week to go. Booooo. If you are trying to avoid soy then beware of ingredients like natural flavors and vitamin e/tocopherols (I thought of this when I saw izze on the list and many flavoured yogurts have this too). Also, things like citric acid and ascorbic acid are which are found in many juices (even when they say 100% juice). I’m also curious about your meat sticks from the farm. Almost all the local (including organic/pasture raised) farms here have their meat processed off-farm and things like salami, and sausage, often contain dextrose and natural flavours, and in the cured items, nitrites as well. Does your source process it themselves? Are they free of these additional additives? I have not been able to find this where I live and was wondering if it exists in other places. MJ, you’re saying Izze’s have soy? Please elaborate on that for me, thank you! And yes, they make the meat sticks themselves, thankfully. I’ve just looked at the Izze website & noticed added sugar to some products, fruit concentrates in others, & organic natural flavors, not 100% natural organic juice, I would be wary of using these products too. It’s been a struggle, it seems like we just finish breakfast and they tell me they want lunch! One thing that helps a lot is that I really don’t keep much junk around here at all, so when I’m doing something and want them to just fend for themselves (the 10 & 13 year old can help the 7 year old or he gets some stuff himself), I don’t have to worry about what they’ll find. I do love the rare mornings when I got to bed at a good time the night before and we wake up and can snuggle, lollygag a bit, have a nice breakfast together (usually eggs or smoothies or waffles or sausage) and still start school by 9:00. But most days it drags closer to 10, and my whole day is thrown off. For lunch it’s nice when we have leftovers that everyone likes (I need to get better about *planned* leftovers), otherwise it’s the typical sandwiches or I might make them quesadillas or something else quick like that. Other days they’ll just snack on cheese sticks, meat sticks (from the farm), crackers, etc. I love this post! I’ve been on a mission to improve the healthfulness of the food I offer my family for about two years now. I’m so glad that there are people like you out there who are making these same changes . . . I can’t believe what foods I used to think of as “healthy” and what most people seem to think is a normal diet. It’s so crazy! We’ve made a lot of changes in the past two years with buying less meat and dairy and trying to find food that is preservative and additive free and what not. We’ve also gone to eating about 60-80% produce thanks to my discovery of Green Smoothie Girl. That was the goal last year, this year the goal is to eat 60-80% raw. Still, I don’t intend to go vegetarian so my focus lately has been on finding safer meats. 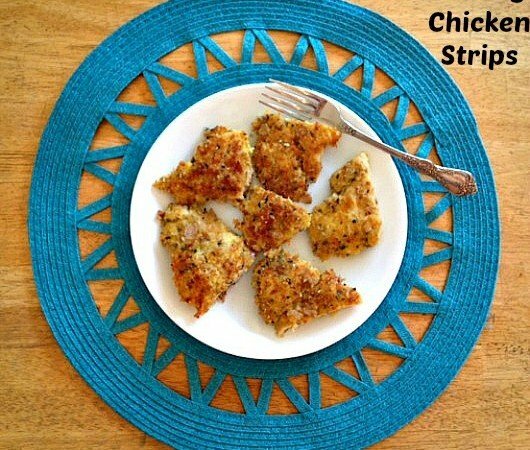 I found your post when a search brought up this article on Almostfit.com https://almostfit.com/2008/07/31/how-to-buy-chicken-without-getting-punched/ which linked to your post here. I love your suggestions and I’m happy to see that I’ve already incorporated most of these alternatives into my own families menu. I don’t have a food dehydrator and always assumed I’d have to in order to make dried fruit leather like my Mom used to, but I used this recipe and (as it suggested) just set my oven on warm to dry it. Worked out great and my kids gobbled it up! What about almond butter? It tastes great and is nutritious. I have never used the other kinds of butters like sunbutter, hazelnut, or cashew…but I’m sure those are good alternatives. Yes, peanut butter is toxic because of the aflatoxin content – a naturally occurring deadly mold in the peanuts themselves. Aflatoxins are part of a larger body of fungus known as Mycotoxins, also found in corn, wheat, or rice – but particularly high levels are found in peanuts. This is one of the main culprits of allergenic reactions. The organic is worse because the butter is less tampered with than the industrially-produced variety where they actually remove a good portion of the aflatoxin (but then the preservatives and chemicals in commercial food are bad too). Almond butter is more expensive, but it’s your child’s health after all. I usually buy the raw type because nuts that are roasted or otherwise heated have the delicate fats and nutrients denatured from the heating process. Organic is better too, but it’s usually twice the cost of the raw almond butter (Maranatha is the brand we use). Almond butter is a good source of natural Omega 6s, which you can become deficient in if you no longer eat a processed diet. That happened to me this summer, and so I now take a Omega 3-6-9 supplement – Udo’s brand mixed natural, organic oils. Anyone here use sunbutter (made from sunflower seeds)? I saw organic PB mentioned several times, but I’ve read mold toxicity is an issue in all peanuts. I use sunbutter because of peanut allergies and learned about mold later. I’ve also read mold/ fungus toxicity is also a problem in all corn. Chanelle, LOVE that idea, how fun! I’m loving this website. I have been “on board” with this kind of eating for about the past year or so, after reading Micheal Pollan, and then Nina Planck. I love all the ideas, because there is still so much for me to learn! I have one idea for your list above that my daughter thinks is great. Instead of apple slices that you have to add lemon juice to, we slice an apple in half, cut out the seeds and stem, and then fill in the hole with peanut butter. Put the apple back together, and it won’t get brown. Plus, it’s fun because it’s like an apple “surprise” when they open it at school! Hi Donna, my heart aches for you. What a great Mom you are that you are not giving up. First of all, I personally would never send my child anywhere for treatment, no matter for how long, without going with them and being there every minute with them, either myself or my husband. I just couldn’t do it. If I wasn’t able to go with them, we would explore other options. 2nd, please get the GAPS book (find it at this post: https://kellythekitchenkop.com/2008/10/probiotics-gaps-diet-resources-to-help.html) and read it cover to cover. I know you will find the help you need there!!! hi my name is Donna and i have a seven year old son that has been diagtons with bi-polar and he has really bad reactions to some foods, he could be fine on minte and the next you just about have to hide from him, i have taken him to alot of doctors just to be told i cant help you. My mom found your article on candida and was telling me about it and i too has found it very intersinting. I was wondering if you have any tips i could use with the doctors. I always seem to find a door that is opening for him and then it gets slammed in our face. I have even taken him to a place in Atlanta to a hosptial and they seem to want him to go to a place to get more treatment that he would be gone from home for three to six months and i just dont know about it because of the stress on him being away from home, please what sould i do please can you help me find out what is going to happen to my son if i dont get him the true help he sooooo needs???? Hope that helps with your “overwhelmedness”! 🙂 Remember, baby steps, a little at a time, and before long you won’t believe how far you’ve come! I look forward to reading more of your ideas! Heather, I’ve got bad news for you…I love that brand of yogurt too, because it’s WHOLE milk, but one time I brought home the chocolate and Kent said he read somewhere that it is FULL of sugar…I looked and sure enough, it’s really bad – I can’t remember exactly, but it had a LOT more sugar than your typical yogurt…sorry!!! Don’t hate me!!! Try the Brown Cow chocolate yogurt–absolutely dacadent! These are GREAT! And I love the links in the comments. I am curious if you have any ideas about foods when traveling. How to avoid the fast food places on a two-three day trip to DISNEYLAND, that sort of thing. THANKS!! We usually get a hotel room and plug in a crockpot to make our own meals throughout the day while we are gone. So I am set once there. It is the GETTING there that makes things difficult. Thanks for any tips/suggestions! Hmmm, I’d never heard that before about egg yolks, thanks for passing that warning along! I thought there was a homemade tortilla recipe at the westonaprice.org site somewhere, but I just looked for a while and couldn’t find it…I have a recipe I’ve been meaning to try, as soon as I do, I’ll post it! A couple of things here: First please be careful with hard boiled eggs in small children’s lunches. I read once that the yolk from hard boiled eggs is one of the top choking hazards for any age. One of the things you can do to help prevent this is to cut your HB eggs in half or even in quarters so that the yolk is no longer a “ball”. The other rhing is that I have been looking for a good tortilla recipe, possibly for the bosch?? Did the person in the earlier post ever develop her recipe? I checked out that site – those lunch boxes look great! Now that I’m FINALLY getting a little more “green” in my thinking, it bugs me that plastic baggies can’t be recycled, and I used a lot of those in lunches in the last school year. These might just be what I need! Great post! 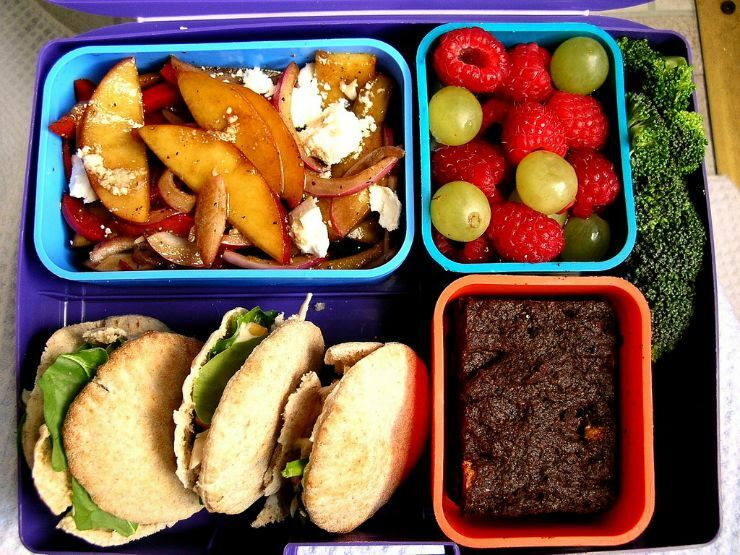 Another resource for packing healthy and waste free lunches is http://www.laptoplunches.com It’s a company called Obentec in California that makes American style bento boxes.. adorable lunchboxes with interlocking, colorful inner containers. I’ve been using mine for years and absolutely adore it! The website has newsletters, hints, photos, links to environmental and health sites and you can order online or find a list of stores that sell the boxes! I go through Panacea for the Buying Club, but I really have to watch it, some things are still less $ online or at Meijer. (Lyn runs a buying club too, they may have room for more…?) At Panacea it’s $15/year to join and Kathi (the owner) charges 10% on every order, since she does all the unloading and stores everything until it gets picked up. For other buying clubs, you have to commit to helping unload the truck once a month or so. Kelly, you mention a buyer’s club a lot. What health food store buyer’s club do you belong to? Is there a fee? Do you have to buy a certain amount of food or spend a certain amount dollarwise? I’m not familiar with a buyer’s club so any information is helpful. Thanks! I LOVE that tip! Thanks! Hi Kelly — I have a teeny little tip to add on to your suggestions. I often pack a hard boiled egg for Grace’s lunch for a good source of protein and a switch from a sandwich. The other thing we always do is sprinkle ground flaxseeds onto her natural peanut butter and all-fruit preserves (no added sugar, just fruit juice).